A new joint venture with 30 top experts and authors from around the globe is set to launch in May 2009. This value added e-publication is led by Canada's Ideaman, Bob Hooey and is a fund raising project for the CAPS Foundation. Canadian Association of Professional Speakers. Pre-order price is only $20 and proceeds go directly to the CAPS Foundation. 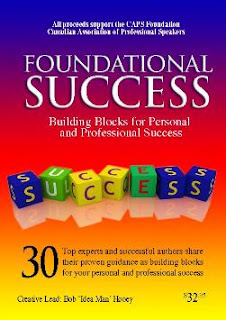 Visit: www.foundationalsuccess.com to see who contributed their wisdom to this new tool in your personal and professional success. Secret Selling Tips creator Bob 'Idea Man' Hooey is pleased to report that his creative series is helping selling professionals become more effective, productive, have more fun and make more money, 'even' in tough times. When we created and launched this series in 2006, we did so for one of our Canadian clients to help their sales teams. They found it valuable and introduced it to some of their American counterparts who also signed up their entire teams. Since then Bob has seen individuals sign up for this paid subscription based sales leaders success program across North America. On a speaking tour in Iran last November Bob found sales professionals their who wanted to subscribe and invited them to become a part of the Secret Selling Tips online family.